Bologna salad bites? I know... you're probably thinking, "um... what in the world!?" Bologna salad is made of hard boiled eggs, bologna, mayo, and sweet pickle relish. Similar to a ham salad or sandwich spread. Little Miss prefers it without the sweet pickle, so I left it out. I cut two slices of her Udi's whole grain gluten free bread with my small round cutter to create bread discs. She can use the mini fork to scoop it onto the slices. 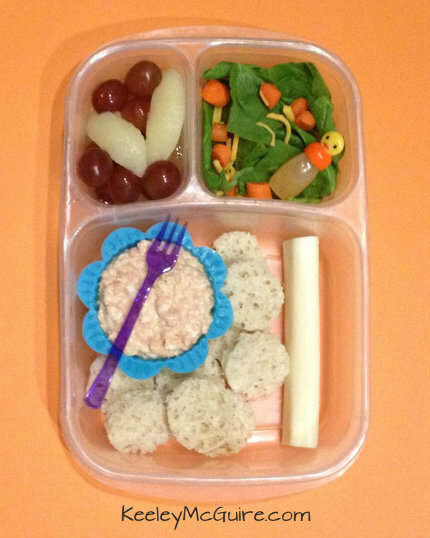 Also included in her EasyLunchBox is a cheese stick, fruit medley of pears & grapes, and a baby spinach side salad with a small container filled with zesty italian dressing. My mom used to make bologna salad! I had forgotten about it! ANYWAY, I wanted to let you know that nominated you for the One Lovely Blogger award! Your blog has been such an inspiration to me! Thank you!! You can check out the details here if you accept :) http://www.bento-logy.blogspot.com/2012/09/one-lovely-blog-very-inspiring-blogger.html Have a great day!